Whether they were focusing on a cybernetic raven with a sardonic side, a Grim Reaper who just wants to figure out how to retire already, or a search engine out for revenge, your flash fiction stories took us into some dark (yet surprisingly fun!) worlds. Pulled from your submissions to our six-word science fiction call, here are a dozen of our favorites. Read them all and then call out your own favorites in the comments — or submit your own right here. We Want To Hear Your Six-Word Science Fiction Tales! 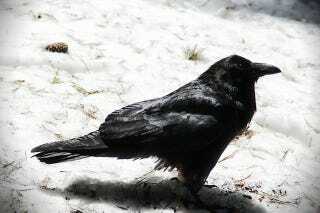 "Beep," said the raven mournfully. "Nevermore." Unfortunately, we were right about Europa. "All intelligence is artificial, flesh creature." "Tag, you're it!" Death said, retiring. Chronox malfunctioning: time copies are fuzzy. Elevators fold space, actually, fooling everyone. "I object!" "Overruled." The Earth vanished. The pandas are aware. Tell others. This morning Wikipedia started asking questions.